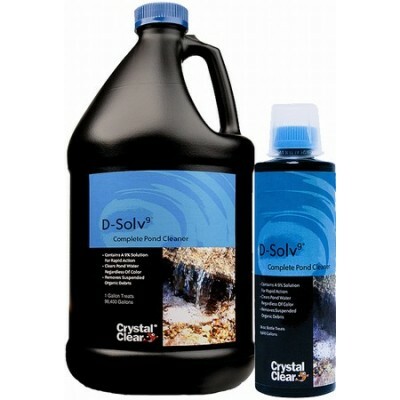 D-Solv9® - Complete Pond Cleaner Contains A 9% Solution For Rapid Action. Clears Pond Water Regardless Of Color and Removes Suspended Organic Debris. D-Solv9® is formulated to be stronger, work faster and more economical per treatment than any similar product on the market today. Use D-Solv9® in the early Spring and hot Summer months when pond water begins to change due to photosynthesis and nutrient loading. Treating discolored pond water has never been easier. D-Solv9 has been re-named ProFix™ by the manufacturer. The formula is the same, only the name has changed. D-Solv9™ has a specifically designed formula to clear pond water quickly and efficiently regardless of water volume. D-Solv9™ can be used in water gardens, fountains, bubblers and streams. When using D-Solv9™ always make sure there is vigorous aeration using a waterfall, bubbler, fountain, air stone or spitter. D-Solv9™ requires heavy aeration especially in hot weather. Shake well before use. D-Solv9™ should only be applied a maximum of once per week at the prescribed rate. When using D-Solv9™ always make sure there is vigorous aerating using a waterfall, bubbler, fountain, air stone or spitter. D-Solv9™ requires heavy aeration especially in hot weather. Designed to be a “Quick Fix” it is recommended that CrystalClear® ClarityMax™ be used after D-Solv9™ treatments for best results. Do not mix or use other water treatments while treating with D-Solv9™.